Catholic Cuisine: Soul Cakes: The Original Halloween "Treat"
The following recipe was submitted by Lisa, from Catholic Missionary Family. Thank you Lisa! During the Middle Ages in England, on the night before All Saints Day, or Hallowmas, pesants and children called "soulers" would go about town singing and praying for the souls of the dead. They would stop at homes and beg for a "soul cake" and promise in return to pray for the household's deceased family members to be released from purgatory. If homeowners did not give out cakes it was believed their home would be cursed. And this my friends is thought to be the origination of trick or treating. There are many recipes for soul cakes from a small round cake to a doughnut shaped treat. Some variations include cutting a cross on the top or adding rasins. It seems that the recipes developed over time and region. Chances are if I try to hand one out people will quietly usher their children to the next house and later report me to the police, so perhaps I'll just stick with taking them to our churches All Souls Day party. If you are looking for a festive treat to make on All Souls Day these are a delicious little treat. They are a bit like a spiced shortbread cookie, not really fluffy cake like. I decided to go with a traditional recipe from food.com, but I'll still post the full instructions with pictures for you below, as I made a few changes as I went. 1. Using a pastry blender cut 1 c. of butter into 3 3/4 cups of flour. I bought my first pastry blender just for this occasion. 2. Blend in the sugar, nutmeg, ginger, cinnamon and allspice. Allspice smells like Christmas. 3. In a separate bowl beat eggs, vinegar and milk together. I would like to add a little shout out here to my amazing mother-in-law, who is always gifting me with amazing things for my kitchen, like these awesome Pyrex measuring cups, Thanks! 4. Add the wet ingredients to the dry ingredients and mix. 5. Kneed thoroughly to form a stiff dough. You really have to work this dough, I thought there was no way it was moist enough, but once I mashed it all up it was just right. 6. Roll out to a 1/4 inch thickness and cut out 3 inch circles with a cookie cutter or glass. 7. Place on a baking sheet and bake at 350 for 20 minutes. 8. 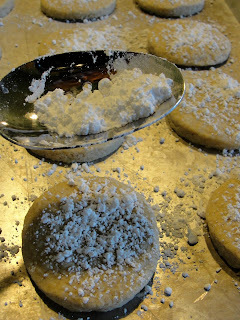 Sprinkle with powdered sugar while still warm. I use a slotted spoon for this. You can find additional recipes for All Hallows' Eve and All Saints Day in the archives! I love the story you wrote with this, and can't wait to try these! How many does this recipe make? I would love to make this for our home school All Saints Day party. @ Anonymous: Great question. The original recipe said 12, but I remember it making at least 36 from one batch. Part of it depends on the size of your cookie cutter and mine may have been a bit smaller than 3 inches. I hope they turn out well, they are really tasty! We just made these this morning and took them to our All Saints Day party! Thank you. these cookies sound delicious and I am going to give them a try! Just an FYI- traditional soul cakes also include currents or raisin and you cut a cross in to them before baking. Very similar to Irish Soda Bread- cut the cross before popping in to the oven. I just got these in the oven, I now must excavate the cupboard for the powered sugar and clean up as they bake. I used a small jar lid to cut the cookies and made almost 30 cookies! Thanks for the recipe! Its not halloween, but oh well. I don't care.